About twice a year we have “Quell,” a time where our whole company gets together to share what different groups are working on, discuss important updates on what’s going on in the back office, and spend time outside of the office together. Over time we’ve played with different ways of having these events, different periodicities, and different ways of spending time together outside of the office. And that’s great, so long as we always remember why we do these events and why it’s worthwhile to take nearly six to eight hours out of everyone’s work week. We want to make sure employees feel connected to each other. Even in a company as small as ours, approximately 30 people, it’s easy for folks to fall into a rut where their work consumes so much of their attention that they are working in a silo. They know there are other people working near them but it’s not always clear what they’re doing and you may not interact with them much in a busy week. It’s important we all feel like we work for one company. We’re a single group with a single high-level goal and it’s critical for people to feel that. Not only is it critical for people to have the feeling that we’re all bailing water together, sailing in the same direction, pulling our oars equally (pick your favorite metaphor) for peace of mind, it actually makes us better at our jobs. Knowing what other groups are working on can make us all better at our jobs. Sometimes that will manifest as the marketing team realizing that what seems like a small bug fix to the developers is worth talking about to other folks outside this building. Sometimes, it’s someone who is not in the products team providing feedback about how we might make some new feature slightly better. More likely, it’s some bit of serendipity we don’t expect and can’t predict. Knowledge helps make those serendipitous moments more likely. The word indoctrinate gets a bad rap. It’s important for a group, a community, to help newcomers understand the norms, expectations, and culture they’re joining. Without that knowledge, it’s hard for someone new to a group to succeed. Our quarterly get-togethers provide one of the best opportunities for our collective group to show each other the tenets that guide the management and work at Rustici Software. 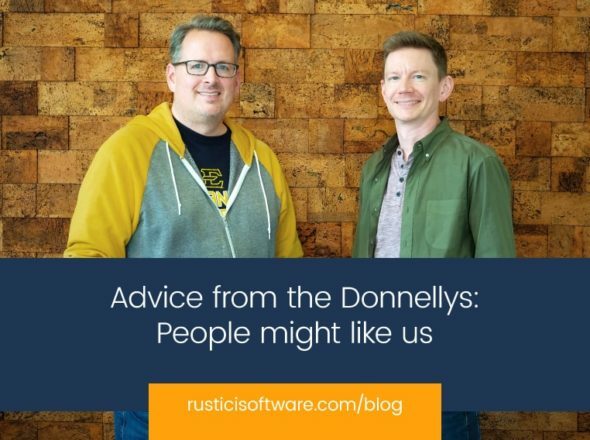 When we talk about the work we’re doing here at Rustici in a group setting we never talk exclusively about what the work is. Rather, we talk about the why of our work and the how of our work. Through these conversations, you get to see the empathy our people (developers, finance, marketing, sales, account management) have towards our customers. You feel the hunger from every group in the organization to find ways to be more efficient and get more done with less. Folks get to hear the care our employees have for each other as they interrupt their own presentations to praise their coworkers. Indoctrination has a bad connotation. But we value bringing new people into our organization and making sure they understand the way we choose to interact with our customers, interact with each other, and go about our work. It’s about making sure everyone understands our company culture and is prepared to be successful. Last, but certainly not least, we want to provide mile markers throughout the year. So much of the way people mark the passing of time is tied to events. Whether those events are holidays, the start of football season, the last of the winter snow finally melting, or something else entirely, these events provide scaffolding for hanging memories on so that we can more easily jump to them in the future. Having moments that force us to step back and reevaluate our world helps ensure we don’t get stuck in a rut. We’re always trying to do more and better.